If you’ve ever seen the (somewhat sombre) Disney holiday classic “One Magic Christmas”, you’ve had a look at Meaford at Christmas. While the film, which stars Mary Steenburgen and Harry Dean Stanton, was filmed in February, back in 1985, locations in snowy Meaford created scenes of Christmas. Steenburgen’s character, Ginny, works in the downtown grocery store, which was known as Glen’s Food Market at the time. The (spoiler alert!) bank that’s robbed is the Bank of Montreal, kitty corner to Glen’s at Trowbridge and Sykes. And when the stolen car peels away, it speeds up Trowbridge to turn at Cook Street. You can see the Hilltop Motel sign a couple of times in one driving scene. And Meaford Hall, at the time the town hall, makes an appearance. But Meaford scenes appear more in this mock “horror” trailer, including the first crane shot of downtown. Holiday celebrations seem warmer and more festive in the glow of candlelight, and Christmas in Meaford isn’t complete without a visit to our local candle factory. For more than a decade, Country Affair Custom Candles has been shipping Meaford-made candles to customers far and wide, as well as helping to light the homes of Meaford folks and visitors to the town. Terry Ellah used to work the flea market circuit, selling various products, candles among them. When his candle supplier disappeared in the mid 90s, he decided he’d learn how to make them himself. It couldn’t be that tough. Actually, candlemaking is quite an art, and fortunately Terry found Peter Parker, a master chandler living in Thornbury, to teach him the secrets of creating beautiful, long-lasting candles. Terry and his wife, Diane, began making hand-poured candles out of their shed and house in rural Meaford, developing a signature style with a bumpy texture. “The idea came out of the states,” says Diane. “We Canadianized it because they were a little too primitive for Canadian tastes, and it’s one of our biggest lines now. Country Affair quickly thrived, wholesaling to retailers across North America. After three expansions to the shed to accommodate the operation and its 10 employees, they decided they needed a bigger space. In 2001, they found it in Meaford’s old “Wheelbarrow Factory”, a poured-concrete building built in the late 1880s for the Meaford Wheelbarrow Company. Along with more space for the candle factory, they now had room for a factory retail outlet, and they opened their doors direct to customers. In the years since, the retail end, which offers furniture, decorations and other homestyle items along with their candles, has grown to represent around half of the company’s business. 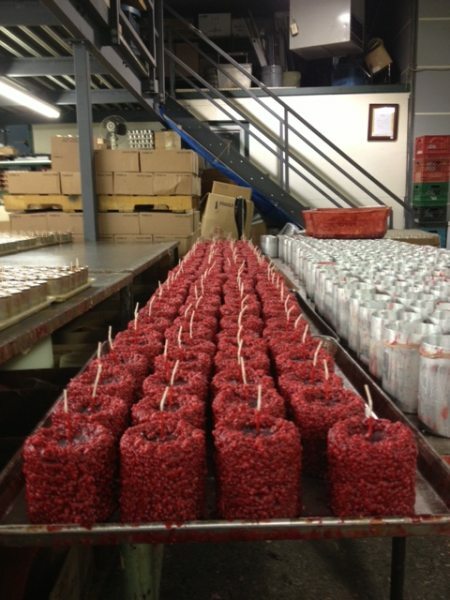 Country Affair continues to make all their candles by hand. Skilled candlemakers melt the wax, add dyes and fragrances and then hand pour them into vessels or molds. The art comes in knowing the properties of different waxes and different dyes and how they react to heat, to create the perfect blend that will look beautiful, smell delightful and burn for a long, long time. The retail space has expanded a number of times, and recently Country Affair opened another storage area to the public, with warehouse sales five times a year. But check things out for yourself. The Candle Factory is located at 267 Marshall St. E. Meaford. Call toll-free 888 771 9912 or visit www.countryaffaircandles.com. 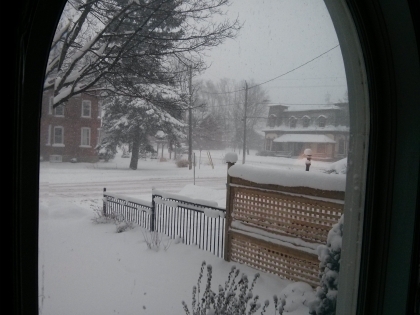 The snow is falling (and falling and falling) in Meaford, and it’s certainly beginning to look a lot like Christmas. Whether you want to stay cozy inside and shop online or stroll the snowy streets, here are some great Christmas ideas for everyone on your list. Tickets to an event, such as Blackie and the Rodeo Kings, at Meaford Hall. A gift certificate, or maybe an Electra Townie from Ride on Bikes. A farm toy, a replica car or a model kit from Jolley’s Farm Toys and Diecast. A hula hoop or hula hoop class from Revolve Hula Hoops. A bottle of locally made Kilannan Ale, Duxbury Cider (or Cidre), or Coffin Ridge wine. A locally made candle or other gift from Country Affair Candles (The Candle Factory). Fresh and locally grown fare and other goodies from The Market. A donation in their name to the Meaford Foodbank, Friends of the Library or the Bighead River Heritage Association. Tickets to a Knights of Meaford hockey game. Almost ANYTHING you can think of from the Meaford Factory Outlet. “Find of all kinds” from The Cat’s Meow. Online gift certificate from a choice of Meaford businesses. A baked treat from Grandma Lambe’s or Almond’s Farm Market. Technology, “toys”, gadgets (and musical instruments!) from Kerry’s Computers and Music, Harbour Microtrends, or Homebuttons. A relaxing massage, manicure or tanning session at Solitudes Spa and Tanning Studio. Flowers and other gifts from Simply Unique Flowers and Gifts or Buds and Branches Flowers and Home Décor. A round of golf for the golfer on your list (or yourself!) from the Meaford Golf Course. Santa will soon be making his way down Sykes Street toward downtown Meaford. Meaford’s annual Santa Clause parade, organized by Meaford Kinsmen, begins this evening at 6:30, with the floats and participants gathering at Olivet Baptist Church and proceeding down the hill to downtown. The nightime nature gives the parade a sparkle and glow that many other parades don’t have. Get out and enjoy the fun.